Littleton Sailing Club is an RYA Training Centre offering courses in dinghy sailing leading to RYA certification for both adults and children. Our beginner dinghy courses are a great way to take your first steps into the exciting sport of dinghy sailing. More information about our adult courses can be found on our training pages. 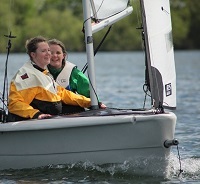 For information on courses for young sailors go to the youth training page. Littleton Sailing Club is delighted to announce that thanks to the efforts of our volunteers past and present, we have been awarded British Youth Sailing (BYS) Recognised Club status by the Royal Yachting Association (RYA). Littleton’s recognition was awarded at the RYA Dinghy Show, Alexandra Palace on Sunday 3rd March 2019. It was received by Stephen Lemmon the 2019 leader for the Junior Sailing Group, and Andrew Selves our Youth Instructor. exacting standards, we run a regular race training programme within recognised BYS classes, youth sailors from the Club participate in BYS Regional Junior Championships (among others) and we continue to deliver training using qualified RYA Coaches to RYA Recognised Training Centre Standards. If you are interested in trying dinghy sailing, or perhaps have previously sailed and want to take it to the next level, see our Youth Sailing activities and opportunities. For more information on the BYS programme, visit the RYA website. Our parent supervised Junior Sailing group re-starts Saturday afternoon 27th April 2019. The aim of Juniors is to introduce youngsters to sailing and, with parents, enhance sailing skills and have fun. All juniors have opportunities to progress in skill to club racing through the Juniors fleet of boats, including Optimists, Toppers, Picos and high performance Fevas. Any young person who is already a member of Littleton Sailing Club or Littleton Lake Sailing Club via family can join Juniors sailing sessions. There is a contribution towards maintenance of the Juniors fleet of £60 for the season.